A Walk in The Neighborhood | What an Amazing World! 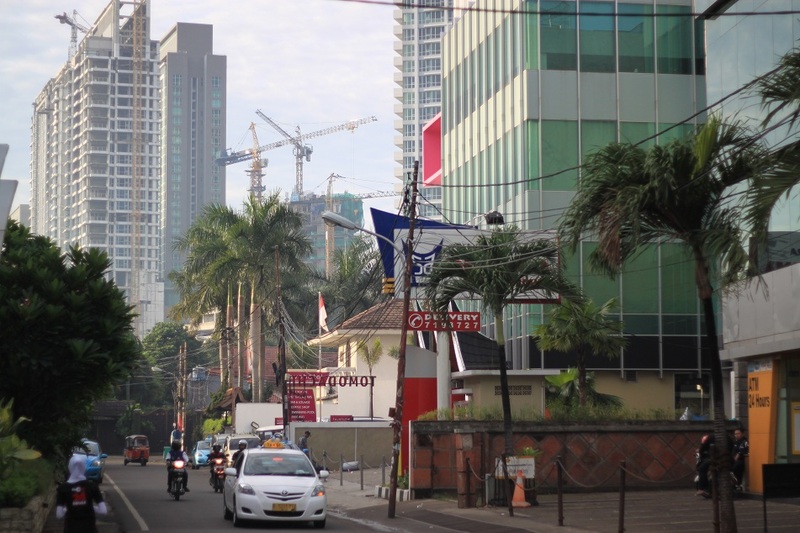 It is a sunny and quiet morning in Kemang, a district in South Jakarta. The usual traffic congestion is absent, supplanted by silence, the occasional sound of chirping birds and the faint banter of breakfast vendors. I walk around the neighborhood and turn down one of the streets which I often drive through in my car. 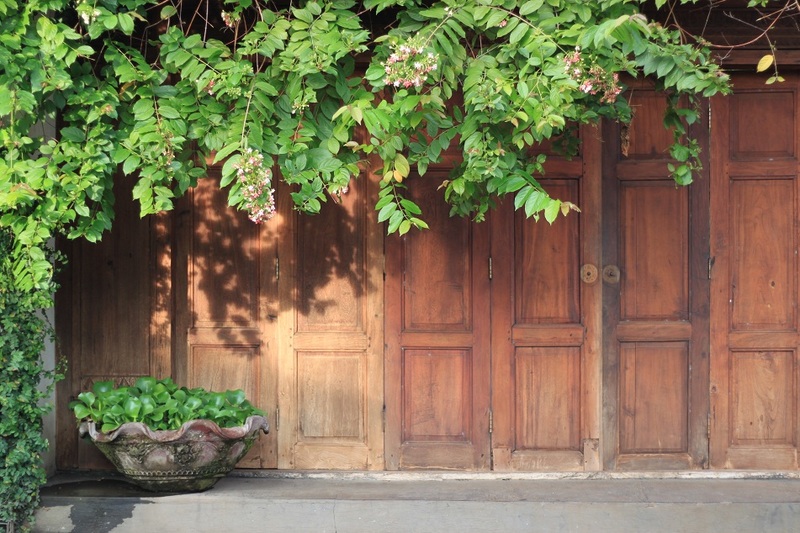 Only this time I have ample time to gaze upon the beautiful sun-kissed walls, ornate fences, and green patches along the street – things I had never paid attention to before. 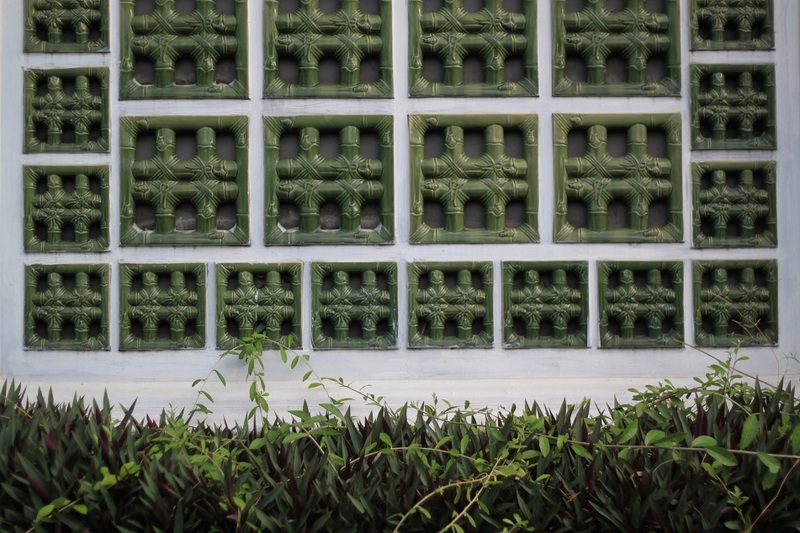 Kemang is one of the hotspots for nightlife and upscale restaurants and cafés in the Indonesian capital. Arrays of Indonesian, Italian, American, Middle Eastern, Mexican, and Indian restaurants along with Irish pubs and ubiquitous fast food chains throng the narrow streets of Kemang. Many times I find it rather overwhelming to walk around this area, particularly at night. But the scene and ambiance are completely different in the morning. 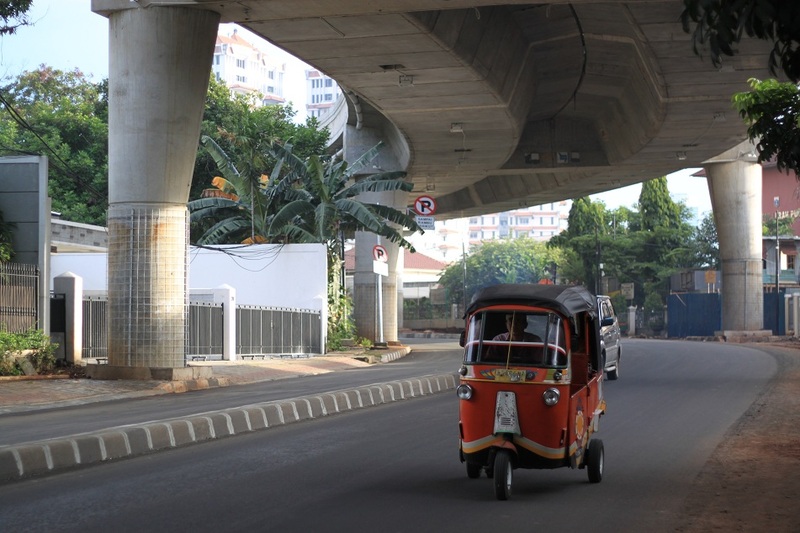 As I walk further in the tranquility of a morning in Kemang, a street opens up to a double-decker street where a newly-built flyover provides shade to the older paved road beneath. Construction is evident in this part of the city, for the sake of both development and growing business opportunities. It is such a peculiar and slightly disturbing thing to see the concrete monoliths standing side by side with pretty houses and their manicured gardens. At another corner, I take another turn to head back to my place. But before that I enjoy breakfast from a traditional food cart which I have never noticed before. An old man, probably in his 60s, attends the modest cart. 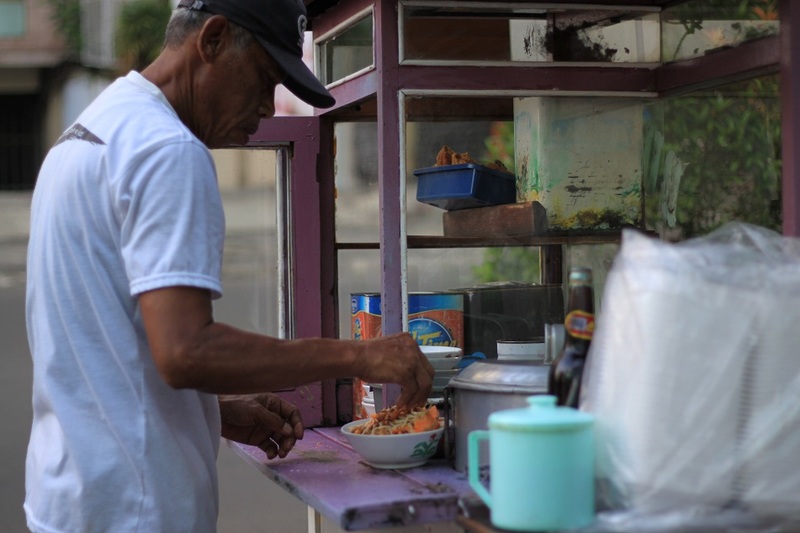 He is a vendor of bubur ayam (Indonesian rice congee) – a delightful concoction of smooth rice porridge, yellow chicken broth, sweet soy sauce, shredded fried chicken, fried soybeans, chopped celery leaves (sometimes also scallions), fried chopped shallots, kerupuk (seasoned starch crackers), emping (Gnetum gnemon crackers), and a spoonful of sambal (ground chili-based sauce). 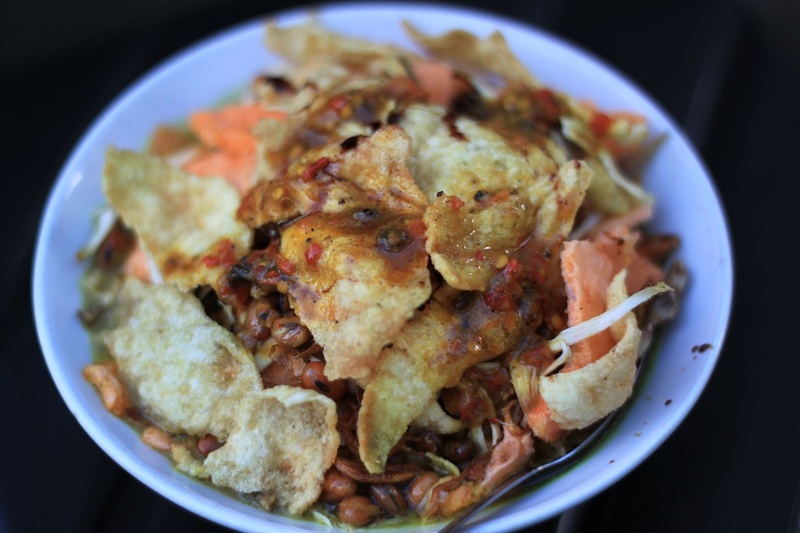 A bowl of this satiating breakfast only costs 6,000 rupiah (roughly US$ 0.60). This is probably one of the things I love about Kemang. On one hand upscale eateries are abundant, but on the other hand it is so easy to find food which costs less than US$ 1. Going back home with full stomach, I cannot help to think. I have just discovered so many things I never knew existed, yet I was not traveling. I was only wandering around my own neighborhood. So what is the definition of travel? Is it a journey? A movement of people or objects from one place to another? Going on a trip? What else? For me, my passion for travel has brought me to some of the world’s most amazing places. But the more I travel, the more I realize that the world has so many more amazing places to explore. Planning any trip will always open my eyes and further my knowledge about places I barely ever heard before, beyond the obvious internationally-renowned sites. But in the excitement I often forget how little I know about my own backyard, my own neighborhood. Walking around the place where I live often brings me the same excitement of discovering exotic locations in far-flung places. Looking at beautiful houses and enjoying vibrant street scenes are some of the things I often ignore and only take for granted. For me, travel is beyond the “been there, done that” paradigm. It is about discovery of new places, and of myself. There were times when I surprised myself for what I did when I was traveling. But above all, I am very grateful for the experiences I had in 2012. A new year has come and more amazing places wait to be explored this year. I was out during last holiday season when most people went to Bandung or Bogor. 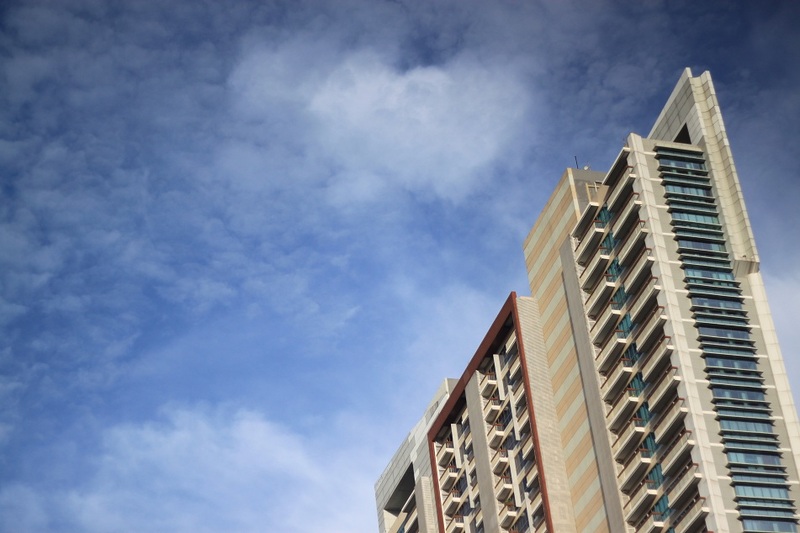 So yea, the clear sky was a rare thing for Jakarta. 🙂 Actually I went to the same bubur ayam vendor the next day because it was really good. Great post! You’re absolutely right. We often miss the greatest adventures in our own back yards. A perfect thought for the New Year! Wishing you a memorable and magical 2013! Thanks Jeanette! I will be doing such thing more often, including when I go back to my hometown probably next August. Wishing you a wonderful 2013 too! I love when you said ‘travel is beyond that been there, done that’ paradigm. You’ve inspired me to show my neighbourhood as well! Oh… and those food photos are making me hungry! A great trip indeed Meredith! True to the essence of it. 🙂 It gave me some ideas to wander around and learn new things in the city, beyond places where I usually go to. You are right about discovering what is around you all the time. Traveling far away also often helps us look at our own surroundings with a new perspective. Yes, it is true Marilyn. 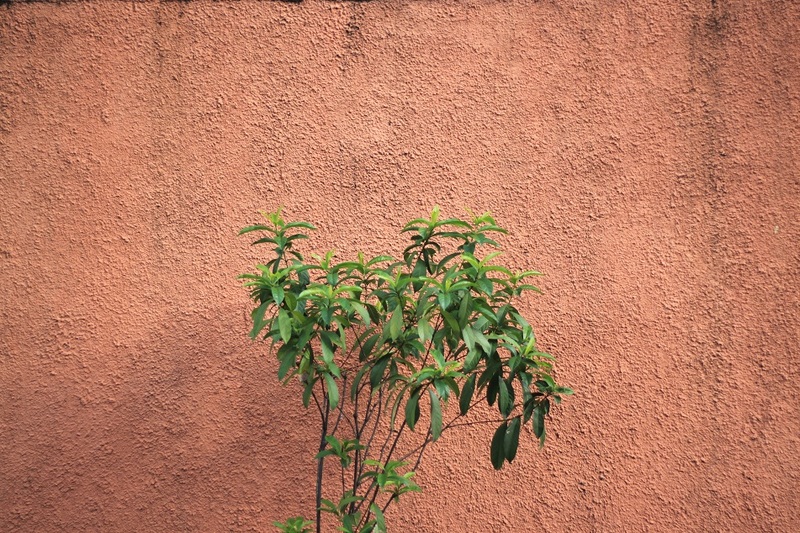 Traveling to faraway places helps me see things differently. That’s why I believe everyone needs to travel. Thanks Marilyn! Indeed! I think walking around the neighborhood has become my newest hobby! 🙂 Oh and that congee was really good, and cheap! It was a lot more pleasant! The streets were so quiet and the sky was clear. I wish we had more days like that in Jakarta. Jakarta need holiday too! Just like us 😀 Well, even though I’m not living at Jakarta actually, but i’m looking forward to get holiday season in Jakarta. Happy new year, sir! Thanks for bringing us along on this morning walk. I find myself seeing the world with new eyes after having traveled so much, too. I also think that seriously practicing photography for the first time has changed my perspective… I look for beauty in simplicity now. Seeing your breakfast has made me really hungry! 😉 Thank you for sharing and Happy New Year once again. You’re welcome Meghan! 🙂 It is one of the reasons why I always encourage my friends to travel because chances are they will return enriched. Of course it’s up to every person to learn from his/her own travel experience. 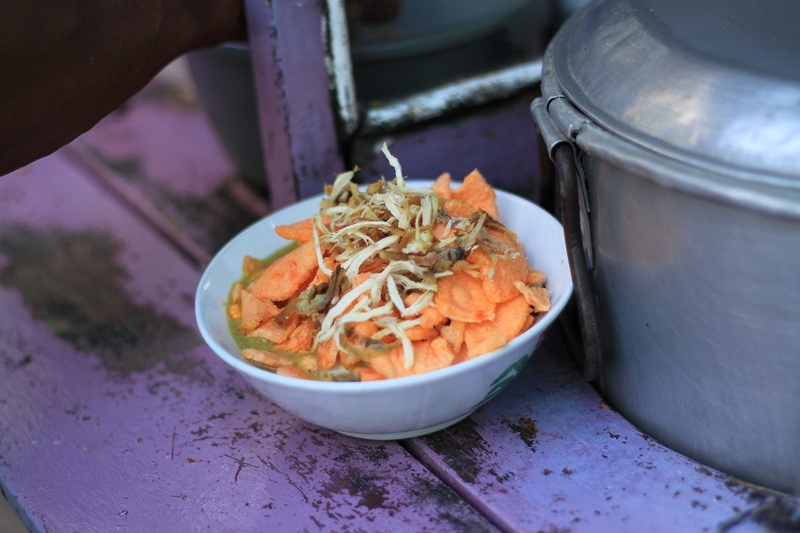 When you happen to visit Indonesia, you might want to try the street food. Most of them are tasty and cheap! 😉 Happy New Year again to you! Yes, indeed it is. However not everyone got such insight because in the end it’s up to the person on how he/she sees his/her travel experience. Great perspective! I love the pictures and the story behind them. Nice work Bam! Wish I spare more time to do this like.. Thanks Bin! I just got back from Cirebon and on the way back to my place I noticed some interesting buildings near Gambir that I never knew existed. You might want to check them too! It was for working. But we got a half-day time to explore some of the city’s most interesting places. 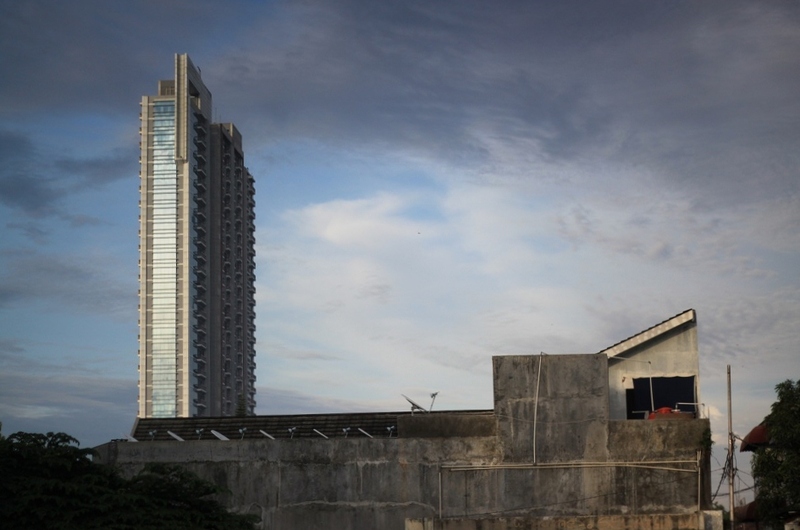 I also loved reading about Kemang and how things are changing there. 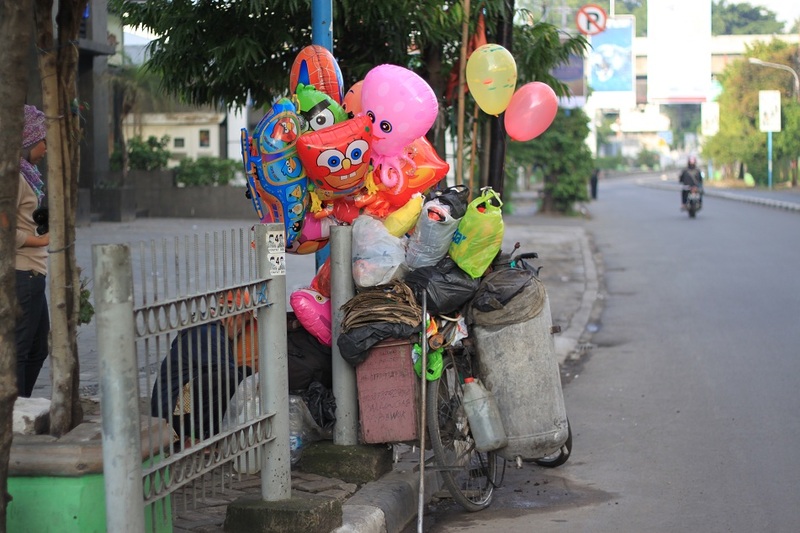 I spent 11 years of my childhood in Jakarta, Indonesia, so it’s definitely bringing back some very fond memories when I look through your website. You have a great blog here – lovely pictures and enticing writing! Keep up the awesome work. Indeed. In fact a few days ago on a train journey back to Jakarta from Cirebon, I noticed some interesting parts of Jakarta I never knew existed. I might check them out very soon. Sindhu, I took a look at your blog and it’s so fascinating to read how you described yourself: “Born Indian, Nurtured Indonesian, Adopted Singaporean, Inspired American”. You are truly a global nomad! Hi Bama, Happy New Year! Just got over some humps of the past few weeks and glad to finally catch up with my favorite blogs. This is such a great welcome post. It’s true we tend to take for granted the wonderful things that surround us day by day, which is sad because we don’t realize what we’re missing. Like you, I have found how rewarding it is to be actually be a tourist in my own city. I realized there’s always a beauty, big or small, to see around you if you let yourself see them. Fortunately, I live in New York City where I can always find something to keep me in awe each day. I guess the more you open yourself to things around you, whether near or far, the more you connect with yourself. Your right, that’s what traveling is all about. Wishing you happy travels in 2013! Hi Marisol! Happy New Year too! I remember reading someone’s blog about NYC and how she captured daily activities in the Big Apple — everything looked so interesting, even the most mundane things! It’s one of the cities I want to visit the most. Wishing you more interesting travels in 2013 too! Hey Bama, if you come to NYC you have to let me know. I’d love to show you around. Thanks Priyanka! I would love to visit India one day! I’m really surprised when you said you fell in love with Jakarta. Actually you’re the second foreigner that I know who love Jakarta – the other was a Canadian women who I met in Bangkok a year ago. 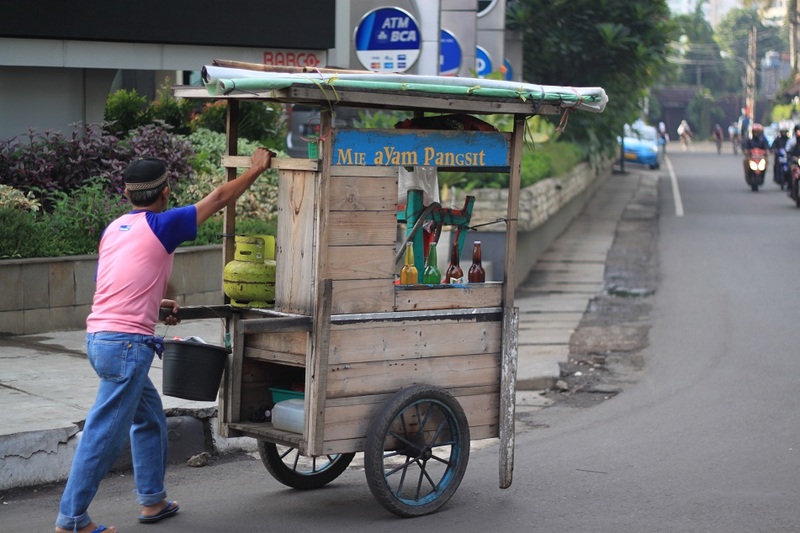 Jakarta is indeed a city hard to love at first, but once you dig deeper you’ll see some of its hidden ‘charms’. Thanks for dropping by Terri! I also had a look at yours and will be back for more! You’ve been to some of the places that I’ve been dreaming to visit. A Bajaj looks so fun to ride in! 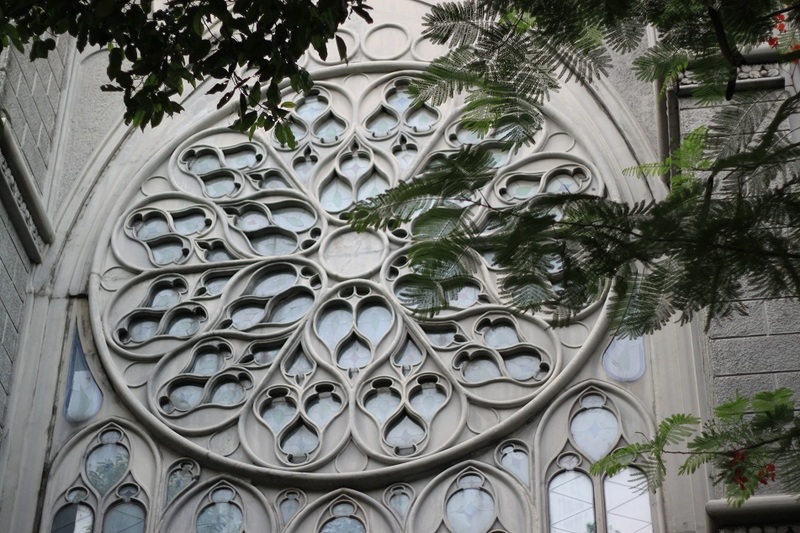 Love the beautiful window! It can be fun and stressful at the same time. When you want to get to a place really fast, you can’t rely on bajaj. Plus it’s really noisy. 🙂 But it would be nice to try at least once in your life. I traveled to Kemang in day light one time. I have to say, it looks so different than the usual night hype that it’s known for. It was like any other street and yet like I’ve never seen it before. Agree. We should always travel beyond ‘been there, done that’. Exactly! That’s what I always feel every time I walk around Kemang on weekends. It’s a completely deserted place on Saturday and Sunday morning, but when the night falls it’s a totally different place.